Shaving for work takes on a whole new meaning when you're Thomas Muller. Merah-merah kat muka lepas bercukur? 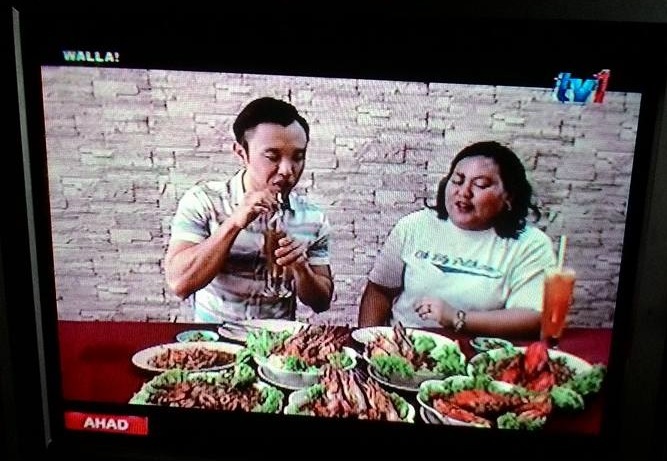 Ermm itu biasa kata Mr Big sebab nak cepat katanya. Itu yang jadi cam tuh, ishk gituh plak. Tapi diorang ni bukan kisah pun, asalkan dah bercukur sudahlah. So hari ni, Gillette mencabar lelaki-lelaki di luar sana untuk berkata TIDAK kepada tanda merah-merah tuh, ZERO REDNESS. Untuk itu, Gillette menawarkan MONEY BACK GUARANTEE kepada pelanggan yang tidak puas hati dengan kebolehan produk Gillette MACH3. Majlis pelancaran Gillette “Close Shave. Zero Redness” Challenge telah pun di lancarkan untuk mendidik para lelaki mengenai tanda-tanda merah lepas bercukur bukan lah biasa tapi sebenarnnya kurang ilmu apa bila membeli pisau pencukur yang betul. Dalam kaji selidik global secara online yang dijalankan oleh Gillette di 14 negara, didapati bahawa bercukur hingga tanda kemerahan timbul menyebabkan sejumlah besar lelaki berasa kurang yakin dan kesan cara mereka berkomunikasi dan berinteraksi dengan orang-orang yang paling dekat dengan mereka. Setelah berada di barisan hadapan teknologi bercukur untuk generasi, Gillette tahu bahawa mencukur hingga kemerahan tidak adalah tidak dapat dielakkan bercukur setiap hari. Kemerahan di muka biasanya hasil daripada kerengsaan kulit dari pencukuran miskin, dan kualiti cukuran yang bergantung kepada kualiti bilah pisau cukur ini. Pelancaran “Close Shave. Zero Redness” Challenge telah dirasmikan oleh Gillette dan disokong oleh Guardian Malaysia. Ean, juruhebah radio hitzfm menjadi tuan rumah acara itu dengan tetamu Fahrin Ahmad dan Fizz Fairuz, pelakon popular Malaysia, mengambil bahagian dalam Cabaran hidup di atas pentas, berjaya menggembirakan penonton. Kedua-dua Fahrin dan Fizz dikehendaki mencukur sebelah wajah mereka dengan pisau cukur Gillette boleh guna dan sisi lain, dengan pisau cukur Gillette MACH3. Selepas bercukur demo secara langsung, kedua-dua Fahrin dan Fizz bersetuju bahawa dengan pisau cukur boleh guna, mereka terpaksa mencukur beberapa kali di tempat yang sama dan dapat merasakan kerengsaan dan ketegangan pada kulit mereka dengan serta-merta. Tetapi dengan Gillette MACH3, bercukur adalah tanpa tenaga. Fahrin menambah: "Gillette MACH3 memberikan saya mendapatkan cukuran yang lebih dekat dan kulit saya berasa sangat licin dan tanpa kerengsaan pada semua!" Turut hadir pada majlis pelancaran itu ialah Encik Zulhaimi Abdul Hamid, Ketua Komunikasi, P & G Malaysia & Singapura, dan Cik Tor Woan Ni, Concourse Pengurus untuk Guardian Malaysia. The blades of Gillette MACH3 are developed to reduce pressure on the skin and result in a clean, close shave in a single stroke, reducing the cause of shaving irritation and redness. Gillette MACH3 razor combines shaving technologies that work together as a manual system to deliver a close, comfortable shave. Gillette MACH3 Standard is an advanced razor that provides a closer shave, and guarantees zero redness. Tried and tested, its nano thin blades are progressively aligned to extend gradually closer to the hair, resulting in a close shave in a single stroke. The blades are individually spring mounted to automatically adjust to different levels of shaving pressure and skin types. A front-pivoting head ensures the razor moves fluidly over the face. All of these functions help reduce the pressure of the blades on the skin; guaranteeing a close and more comfortable shave with zero redness. Gillette MACH3 Turbo shaving system adds significant performance enhancements to MACH3’s breakthrough technologies. Advanced Anti-Friction blades reduce the cutting force needed to slice through hair. An ultra-soft protective skin guard with thinner microfins engages beard hair and stretches the skin more effectively. The result is the closest and most comfortable shave with less irritation, even when shaving against the grain. Gillette MACH3 Sensitive is an advanced razor designed for men who want a close shave with more comfort – great performance even on sensitive skin. 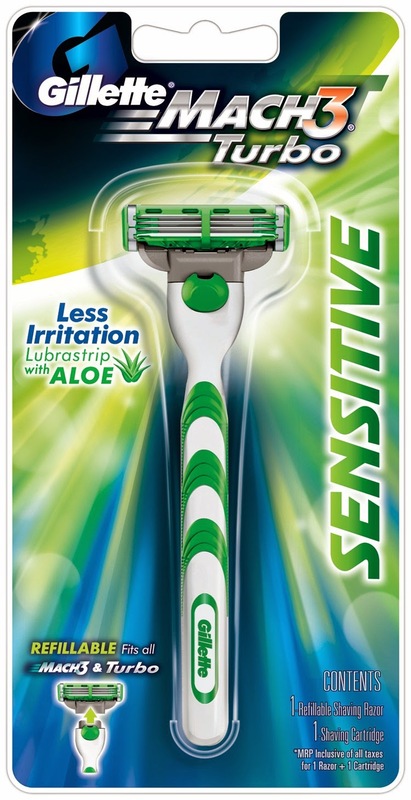 This razor combines Gillette’s best triple blade technology with an enhanced lubrastrip that has a touch of Aloe Vera to release more lubrication with every stroke and help the blades glide easily with more comfort even on the most sensitive areas of the face. Beard hair is about as tough as copper wire; soften it by washing your face and neck with warm water and a mild soap, removing natural oils and perspiration that inhibit water penetration. After approximately three minutes of soaking, your beard hair will be optimally softened; in fact, the force required to cut beard hair is reduced by almost 70 percent after only two minutes. Although water is an essential softening agent, it evaporates quickly. Shaving cream or gel moisturises and softens beard hair, creating a protective layer of lubrication to maximise razor glide. Use light, gentle strokes whether shaving with or against whisker growth. For ultimate comfort, use Gillette MACH3 razors. The blades of Gillette MACH3 are developed to reduce pressure on the skin and result in a clean, close shave in a single stroke, reducing the cause of shaving irritation and redness. The toughest hairs grow on the chin and around the lips. Save these areas for last as more time soaking in shave gel will soften them further. At the end of every shave, rinse your face and neck with cool water to close pores and soothe freshly exfoliated skin. Pat dry. Rinse your razor thoroughly and shake off excess water before storing. Do not wipe the blades, as this can damage the fine shaving surface. Ok masa yang ditunggu, simple giveaway untuk korang. Q1: Why is it important to use light, gentle strokes? 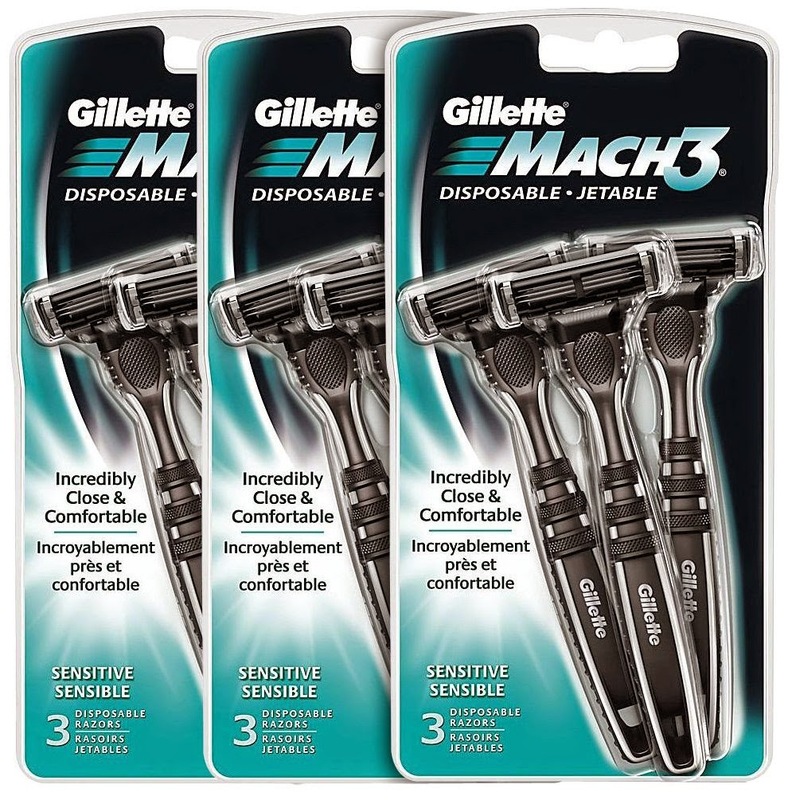 Q2: Name one of the Gillette MACH3 range? Q3: What is the name of the Gillette campaign launched recently? 1. Open to ALL of my readers. 2. Contest period is from 12th Dec – 17th Dec 2014. 5. The five (5) winners will be announced on my blog by 18 Dec 2014. 6. 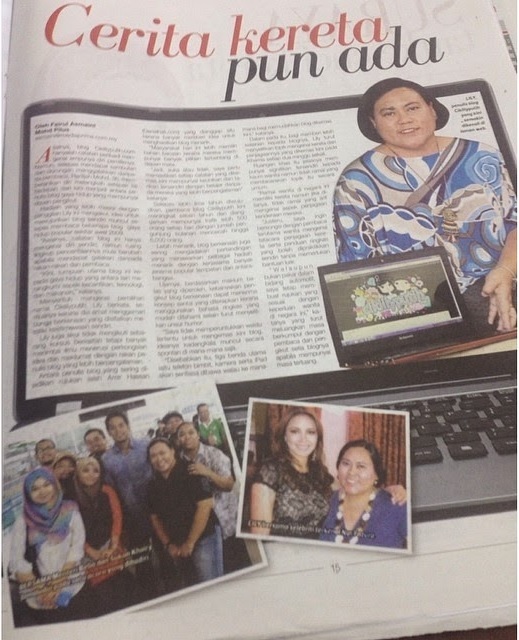 The winners have to contact Key Message PR Sdn Bhd latest by 18 Dec 2014 to redeem their prizes. 7. Key Message PR will handle delivery of prizes to the winners. Untuk details lanjut mengenai Gillette “Zero Redness” Challenge serta terma dan syarat tentang Money Back Guarantee, layari ke www.facebook.com/GilletteMalaysia or call 1 800 883 957. Answer 1 :Use light, gentle strokes whether shaving with or against whisker growth. For ultimate comfort, use Gillette MACH3 razors. The blades of Gillette MACH3 are developed to reduce pressure on the skin and result in a clean, close shave in a single stroke, reducing the cause of shaving irritation and redness. Answer 2 :Gillette MACH3 Sensitive is an advanced razor designed for men who want a close shave with more comfort – great performance even on sensitive skin. This razor combines Gillette’s best triple blade technology with an enhanced lubrastrip that has a touch of Aloe Vera to release more lubrication with every stroke and help the blades glide easily with more comfort even on the most sensitive areas of the face. Answer 1 : to reduce pressure on the skin and result in a clean also reducing the cause of shaving irritation and redness. Ans 1:to reduce pressure on the skin and result in a clean, close shave in a single stroke, reducing the cause of shaving irritation and redness. Bazaar 'Markets14' by Jaya One… Jom Shopping!